Clients who are starting a business often ask “Do I need to make estimated payments?” The answer, as with most tax questions, is “It depends”. While the IRS, states and cities each have their own set of rules for making estimated payments, this article will discuss only the federal provisions for individuals. 100% of the prior year tax (as long as the prior year covered all twelve months). The above percentages are commonly known as safe-harbors. These percentages may be different for farmers, fisherman, or high income taxpayers. For farmers and fisherman, if at least two-thirds of your income is from farming or fishing, you can substitute 66 2/3% for the 90% shown above. For higher income taxpayers, if your adjusted gross income (AGI) is over $150,000, you will need to pay in 110% of the prior year tax instead of 100% as shown above to avoid penalties. For 2017 and earlier years, AGI was the bottom line on the first page of the Form 1040. Starting in 2018, AGI is line 7 on the second page of the 1040 form. If, in addition to your business income, you also receive salaries and wages, you may be able to avoid paying estimates by having your employer bump up your withholding. We often see higher income W-2 earners owing with their tax returns because they do not have enough tax withheld. In these cases, if nothing is done to increase withholding, and no estimates are paid, the requirements above can cause a penalty on the return, even though the taxpayer has no other outside income. Another safe-harbor that exists stems from having no tax liability for the prior year. In that case, you are not required to make estimated payments for the current year. However, if you make no estimated payments, you need to be prepared to pay any balance due when your returns are filed, plus you will owe the first estimate that will be due for the next year, both of which will be due April 15th. So plan ahead! If you do find yourself in the position of having to make estimated payments, the due dates are on the 15th of April, June, September and January, unless weekends come into play, in which case, they are due the following Monday. Payments can be made in several ways including online at IRS.gov/payments by using a debit or credit card, electronic funds withdrawal, or through the electronic federal tax payments system, known as EFTPS (you must have an account set up for this one). You can also pay by phone or through a mobile device by downloading the IRS2Go app. And yes, you can still pay the old-fashioned way by sending in a payment voucher, Form 1040-ES, with a check or money order payable to U.S. Treasury. 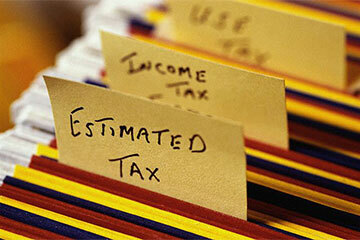 For more information, please see your tax advisor, or go to the IRS website at www.IRS.gov. Thank you for all of your questions, comments and suggestions for future topics. We may be reached in Dayton at 937-436-3133 and in Xenia at 937-372-3504. Or visit our website.